Having multiple features and ways for users to interact within Auction Factory, in order to keep track of the activity happening on your website, you can visit the Monitoring section. This page provides various informational lists of bids made, messages, ratings or reports, allowing you to manage them, if needed. The Bid History page displays a list of bids made by users showing additional information such as the type of the bid, the amount paid, the date when it was made or the user who did it. Clicking on an auction title allows you to view details of that respective auction and to edit it. Go to Auction Factory / Monitoring and press the Bid Reports button in the top left corner. Clicking on Bid reports will open a window, where you have to determine your prefered timeframe. Reviews can be deleted if necessary. These are auctions that users have viewed as offensive/illegal and have reported. You can check the exact date and time when the report was made, a message which describes the reason of the report, the title, and if is in progress or if has been solved. 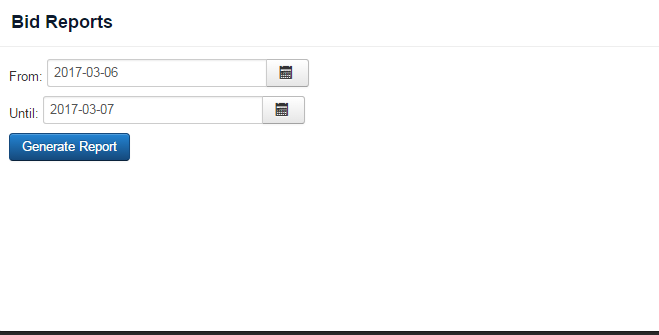 After the respective issues are resolved you can toggle the report' status to Solved. A filter is also available which allows you to display only the solved or unsolved reports. Various information and useful links can be found on the About page regarding Auction Factory and other extensions by thePHPfactory. Check this page regularly so you can see if your component is up to date.